Free Dove Oxygen Moisture Shampoo, Conditioner & Coupons!! 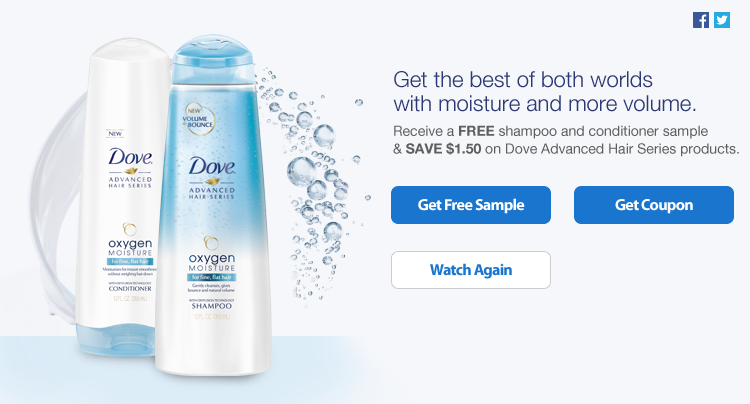 Watch the Dove video HERE to get a FREE sample of Dove Oxygen Moisture shampoo and conditioner & a coupon to save $1.50 off your next purchase of Dove Advanced Hair Series products! After the video HERE is over, a screen identical to the one above will appear prompting you to request a sample or print a coupon.